Due to a very curious class action lawsuit that claims "where's the beef?" 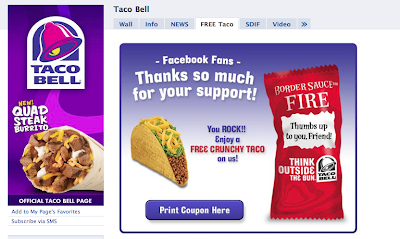 in Taco Bell meat, Taco Bell is giving a free crunchy taco to all their Facebook fans. Want yours? Go get it. After 10 million downloads, the offer will cease to exist. I printed mine and it expires February 16 - your date might be different, however. Click here to sign up for NYC Recession Diary Emails! The Largest Directory of Free Online Sweepstakes!